Although the use of torture as punishment seems archaic, it is still practiced in more than 125 countries and continues to rise across the globe. Photojournalism Professor John Kaplan is focused on new ways to investigate civil rights issues like torture and the exploration of cultural diversity. Kaplan’s recently completed photographic project, Surviving Torture, documents victims of torture in West Africa. Through his photographic portraits and written accounts of alleged war crimes, his goal is to show the extensive violence committed in the civil wars of Sierra Leone and Liberia. “My field work and social documentary projects seek to build bridges between seemingly disparate peoples,” Kaplan says. The United Nations has asked to use these photographs to help facilitate contact with the victims. Surviving Torture has been shown at Visa Pour L’image in France, the world’s most influential photojournalism symposium; it has also been recognized by the Robert F. Kennedy Foundation. The project was also named winner of the Overseas Press Club Award for Feature Photography. Another of Kaplan’s studies, Four Nations, views freedoms in Russia, Cuba, China and the United States. His photographs portray that each of these countries share a common bond; their citizens are united in search for freedom. Kaplan is also working on a touring exhibition, Vanishing Heritage, which compares and contrasts ethnic minority groups in Tibet and Bolivia. His research shows that every nation sees cultures in danger of extinction due to rapid industrialization and the globalization of world culture. “Kaplan’s applied research has helped him do what no other journalism professor has ever accomplished,” says William McKeen, professor and chair of the journalism department. 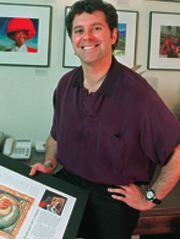 Kaplan won the Pulitzer Prize for feature photography in 1992 for his series on the diverse lifestyles of 21-year-olds.